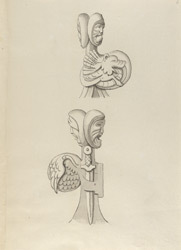 Drawing of two matching bench heads from St Paul's Church in Jarrow. This was an ancient parish church, incorporating the remains of an Anglo-Saxon monastic church of the late 7th century. The artist Samuel Grimm liked to record 'everything curious' on his sketching tours and had an eye for amusing and sometimes grotesque decorative details. The carvings are in the form of double headed grotesque faces.